London and New York, 5 October 2017 – Seven giant wind projects, each costing between $600 million and $4.5 billion, and spread between the U.S., Mexico, the U.K., Germany, China and Australia, helped global clean energy investment to jump 40% year-on-year in the third quarter of 2017. The latest authoritative figures from the Bloomberg New Energy Finance database of deals and projects show that the world invested $66.9 billion in clean energy in 3Q 2017, up from $64.9 billion in the second quarter of this year and $47.8 billion in the third quarter of 2016. The numbers for the July-to-September quarter mean that investment in 2017 so far is running 2% above that in the same period of last year, suggesting that the annual total is likely to finish up close to, or a little ahead of, 2016’s figure of $287.5 billion. This year looks highly unlikely, however, to beat the record of $348.5 billion reached in 2015. The stand-out move of the third quarter of 2017 was American Electric Power investing $4.5 billion in Invenergy’s 2GW Wind Catcher project in the Oklahoma Panhandle. Due to be completed by 2020, the project will have 800 turbines, connected to population centers via a 350-mile high-voltage power line. AEP still needs to secure some regulatory approvals, but construction has started and BNEF is treating the project as financed. The other top asset finance transactions of the quarter were Dong Energy’s decision to proceed with the 1.4GW Hornsea 2 offshore wind farm in the U.K. North Sea, at an estimated $3.7 billion by the time it is completed in 2022-2023, and Northland Power’s financing of the 252MW Deutsche Bucht array in German waters, at $1.6 billion. After those came two Chinese offshore wind farms (Guohua Dongtai and Zhoushan Putuo) totaling 552MW and an estimated $2.1 billion, the Zuma Reynosa III onshore wind farm in Mexico, at 424MW and an estimated $657 million, and the 450MW Coopers Gap onshore wind project in Queensland, Australia at $631 million. The biggest solar project financing was an estimated $460 million for First Solar’s 381MW California Flats PV park in the U.S. Breaking the 3Q 2017 figures down by type of investment, asset finance of utility-scale renewable energy projects, such as those above, jumped 72% globally compared to the same quarter of last year, reaching $54.3 billion. Small-scale project investment (solar systems of less than 1MW) came to $10.8 billion in the latest quarter, up 9%. The two other areas of investment that BNEF tracks quarterly are venture capital and private equity investment in specialist clean energy companies, and equity-raising on public markets by quoted companies in the sector. Both these areas had subdued activity in the third quarter. VC/PE funding was only $662 million in 3Q, down 79% from a very strong equivalent period a year earlier. July to September 2017 was the weakest quarter for this type of investment since 2005. The only deal to break three-figure millions was a $109 million private equity expansion capital round for Indian solar project developer Clean Max Enviro Energy Solutions. Public markets investment was also subdued, down 63% year-on-year at $1.4 billion, its lowest quarter since 1Q 2016. The biggest equity raisings were by Chinese company Beijing Shouhang Resources Saving, to fund activity in solar thermal generation (a $675 million private placement), and a $314 million initial public offering by Greencoat Renewables, a Dublin-based investment company targeting operating-stage wind projects in Ireland and the rest of the euro area. China $23.8 billion, up 35% compared to 2Q 2016, down 8% from 2Q 2017. The U.S. $14.8 billion, up 45% year-on-year, up 8% quarter-on-quarter. Europe $11.6 billion, up 43% year-on-year, up 45% quarter-on-quarter. Germany $2.4 billion, down 5% year-on-year, down 26% quarter-on-quarter. Japan $2.2 billion, down 32% year-on-year, down 17% quarter-on-quarter. India $1.1 billion, down 49% year-on-year, down 60% quarter-on-quarter. Brazil $1.7 billion, up 32% year-on-year, down 4% quarter-on-quarter. Mexico $2.8 billion, up from almost nothing a year earlier, up 84% quarter-on-quarter. Australia $1.8 billion, up 388% year-on-year, down 10% quarter-on-quarter. Turkey $796 million, up from almost nothing a year earlier, and up 312% on 2Q 2017. France $631 million, up 109% year-on-year, down 21% quarter-on-quarter. South Korea $593 million, up 143% year-on-year and up 85% on 2Q 2017. Argentina $1.2 billion, up from almost nothing in 3Q 2016 and up 151% from 2Q 2017. The U.K. $4.6 billion, up 57% year-on-year, up tenfold quarter-on-quarter. Chile $1 billion, up 134% year-on-year, up 306% quarter-on-quarter. 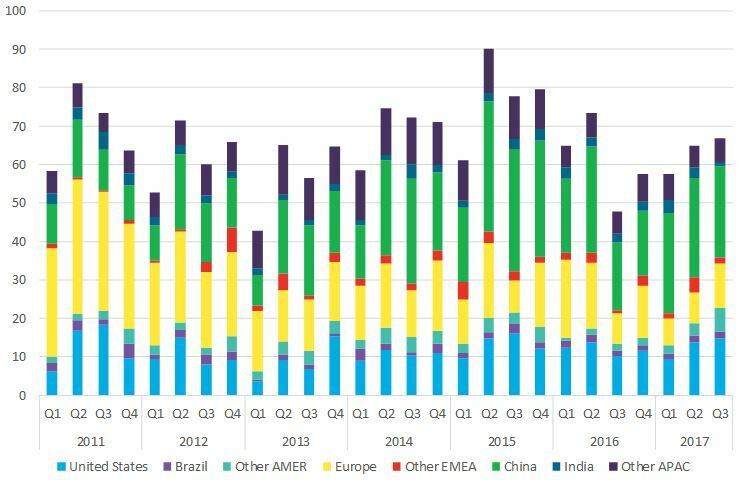 The following chart shows the quarterly trend in clean energy investment by region. Source: Bloomberg New Energy Finance. Note: In this chart, asset finance is adjusted for re-invested equity. Clean energy covers renewable energy excluding large hydro, plus energy smart technologies such as energy efficiency, demand response, energy storage and electric vehicles. BNEF’s annual figures, published every January, include certain categories of investment that are not in the quarterly data – namely corporate and government R&D in clean energy and asset finance of smart meters and energy storage projects. Clean energy is renewable energy excluding large hydro-electric projects of more than 50MW; plus energy smart technologies such as smart grid, battery storage and electric vehicles.